The Shield was the first TV show that made me lose sleep after watching an episode. It was the first TV show that really showed what cable TV could do, and along with 24, set the bar for justice dramas for years to come. I got into The Shield around 2006. I ripped through the first five seasons and then absorbed six and seven when they were released on DVD. It quickly became one of my favorite TV shows ever, and remains that way today. The show is amazingly written, the acting is fantastic, and there are plenty of turns you’ll never see coming. The show is just as relevant now as it was then (save for a few dated references and songs). This was Breaking Bad before Breaking Bad. Unfortunately, the broadcast quality of the series, especially in the early going, wasn’t what we’re used to now. I remember years ago that Shawn Ryan said he was working on a Shield remaster, but then there was a year of silence. It seemed like the day would never come. Finally, there was a pre-order on Amazon for $120, and it was set for November of 2018. I jumped on it immediately - that’s under $20 a season. After a couple delays, it finally arrived today. With this careful 4K restoration, Shawn Ryan has fixed that. 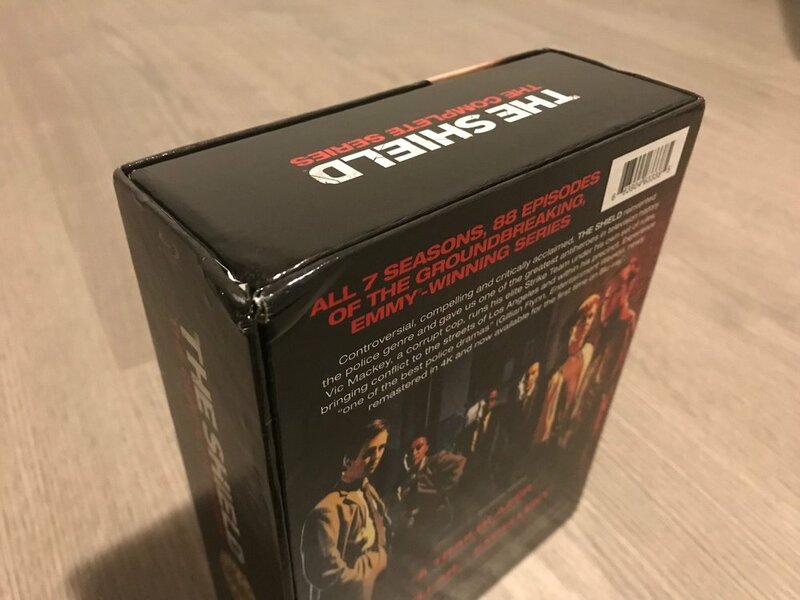 This Blu-Ray set gives us all seven seasons remastered, along with a ton of extras. I popped in a few discs from different seasons to see the transformation and it’s huge. The show looks great. The difference from the DVD to this restoration really is astounding and you can see the time and care it took to make it happen in every frame. The original broadcast was 4:3, this is now widescreen at 1:78:1. The packaging looks great, although Amazon dinged my box up by sending it in an envelope instead of a box. The discs are housed in a book, with each page housing a disc. The front has an embossed shield, which slides into a box with a magnetic flap. It looks great. Amazon beat my box up like Vic beats perps with phone books. If you’re a fan of Breaking Bad, The Wire, or early seasons of Sons of Anarchy, you have to check out The Shield. It’s one of the best TV shows ever made and unlike a lot of shows (ie. Dexter, Lost, The Sopranos), it has a perfect close at the end of its run. Here are some pics of the box set. Go order it now!